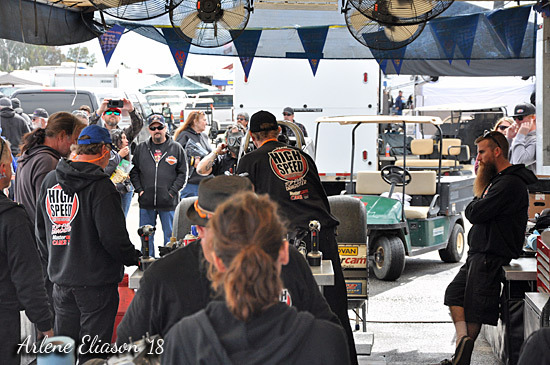 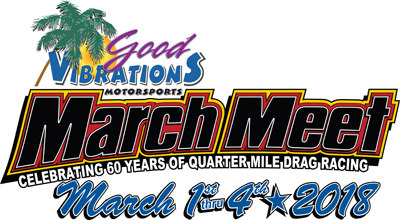 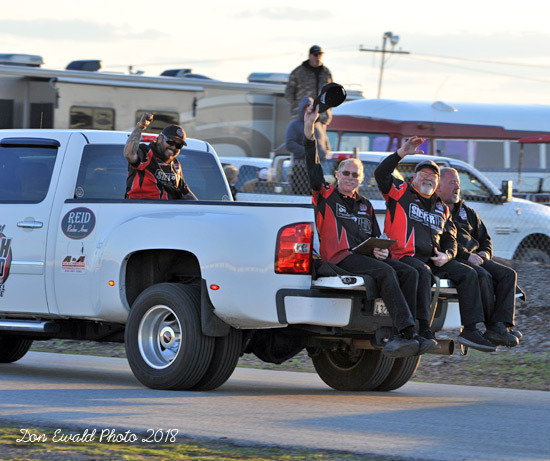 Coming into the 2018 Good Vibrations Motorsports March Meet Mendy Fry and the HSMS team were confident they could go back-to-back after handily winning the 2017 race. 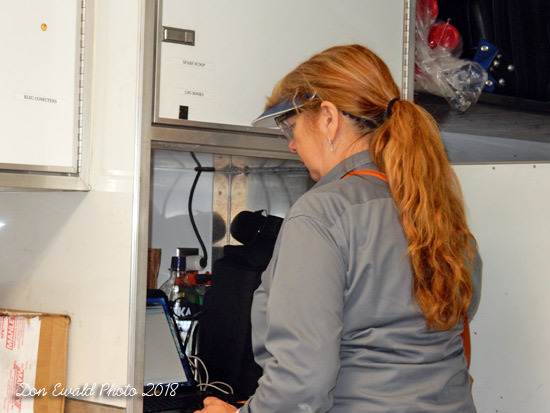 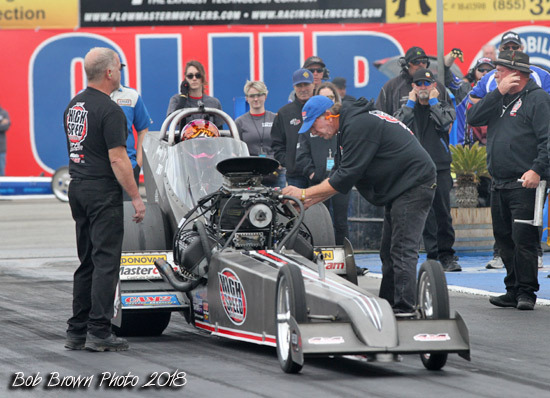 However, the weekend was plagued with cold and rainy weather that turned the schedule upside down and played a major roll in Fry's failure to repeat. 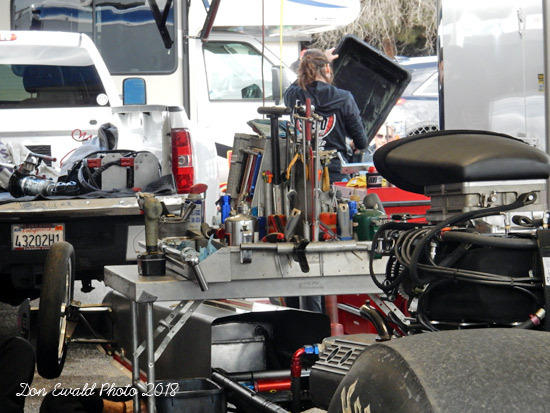 Thursday was dry and there were a lot of cars who took advantage of the open testing. 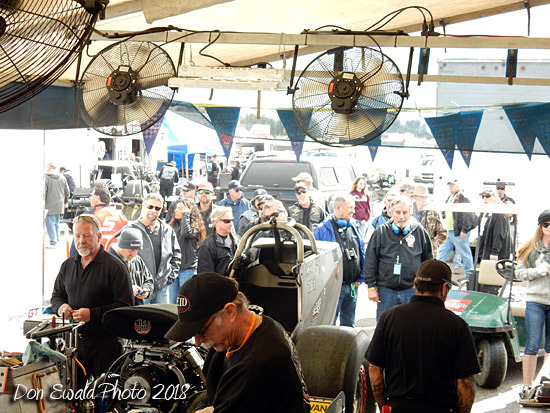 That was the good news. 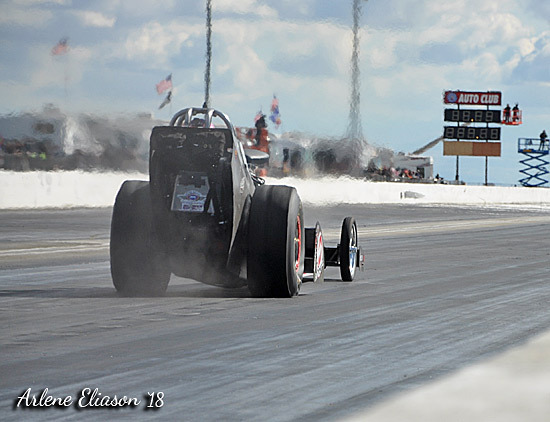 The race officially kicked off with Friday Qualifying. 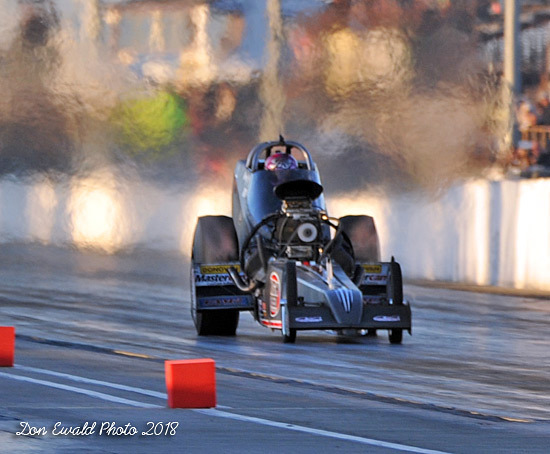 In the sole Top Fuel session that featured a host of off pace runs it was Mendy Fry who managed to put a good number up (5.736 at just 219.51) leaving her #1 and the class of the field by over two tenths. 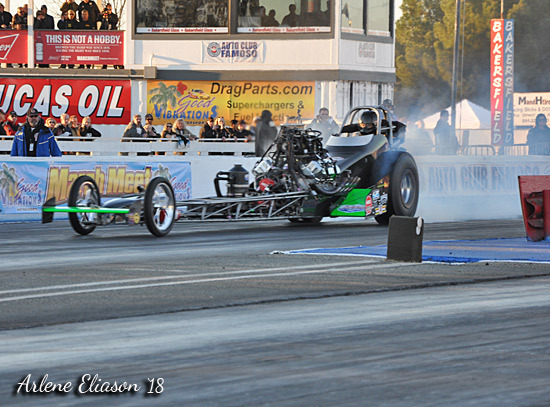 The 8 car bump spot was a dismal 7.515 at 215.27. 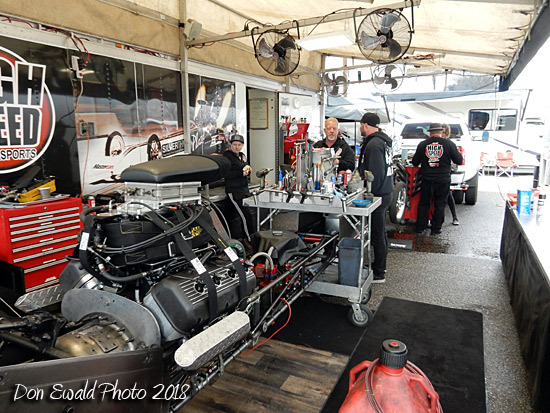 With rain literally washing out the other two session meant that those racing on Sunday would be a crap shoot with their lack of data and uncertain conditions. 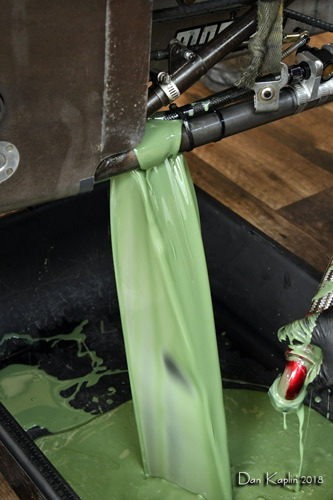 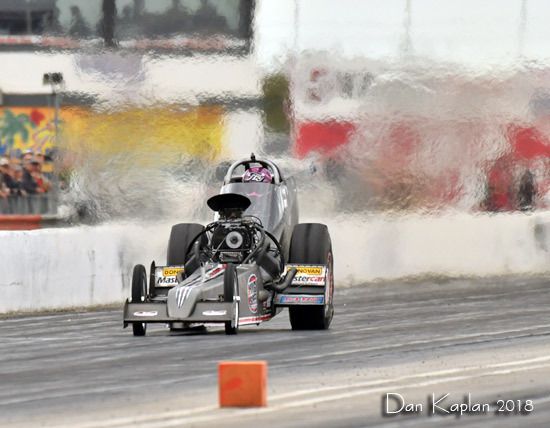 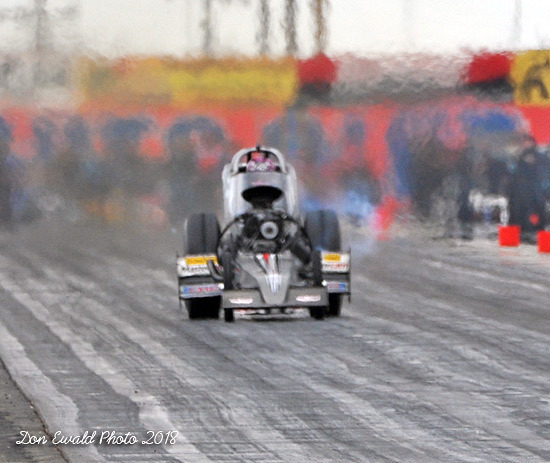 After calling it due to rain on Saturday afternoon, officials made the decision to run 8-car Top Fuel Eliminations on Sunday based on Friday qualifying session order. 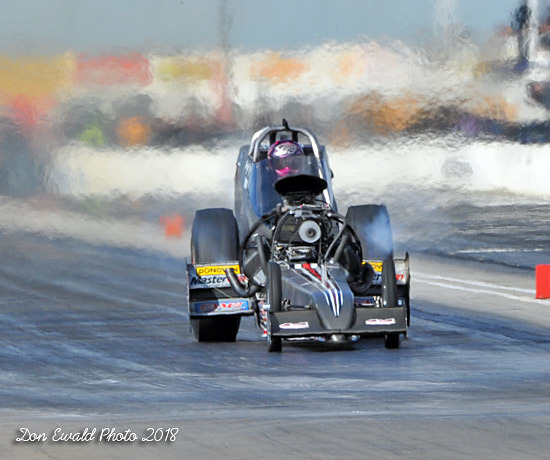 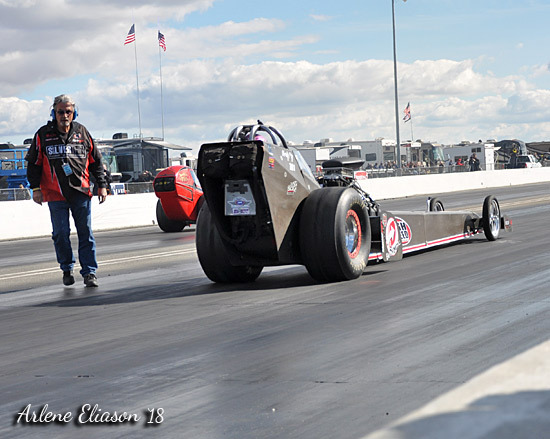 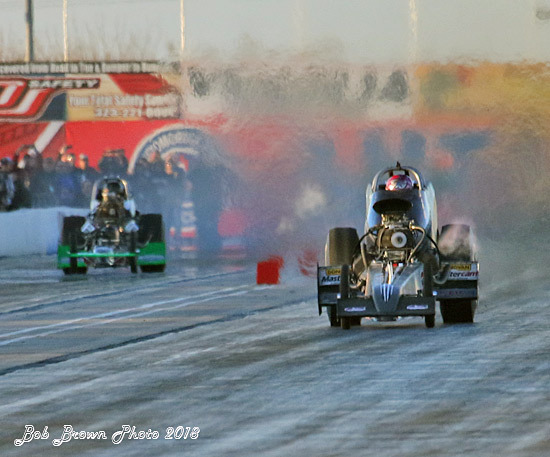 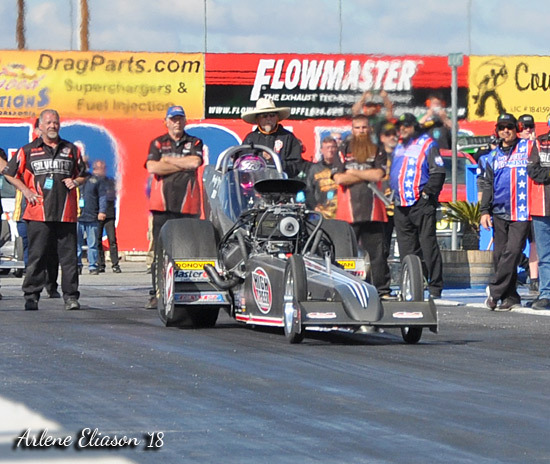 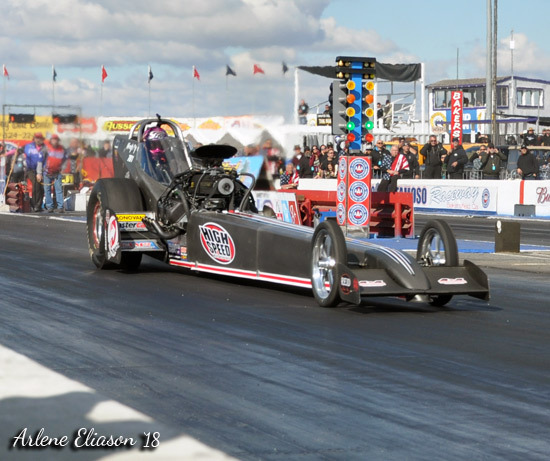 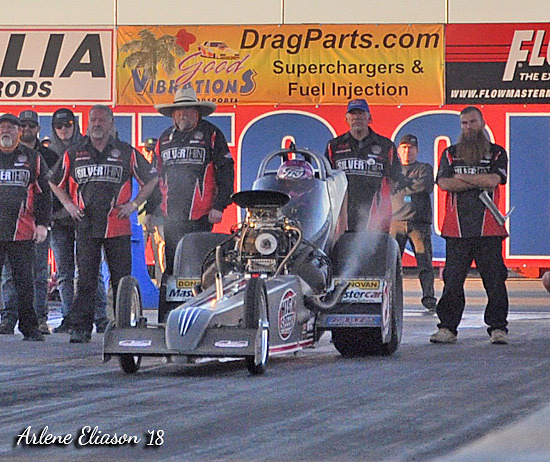 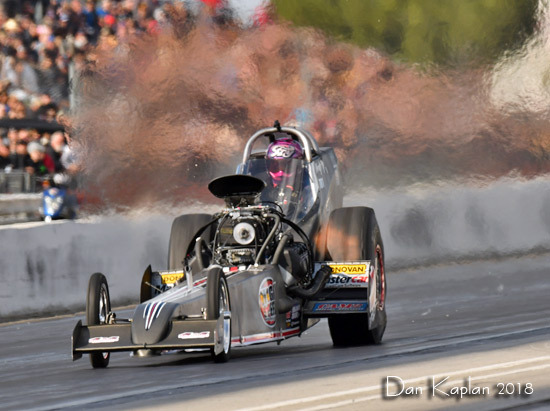 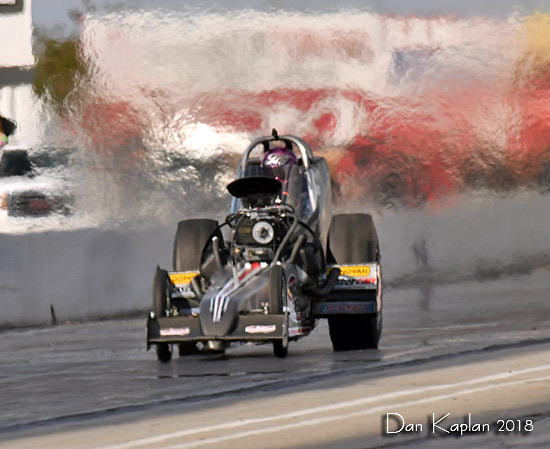 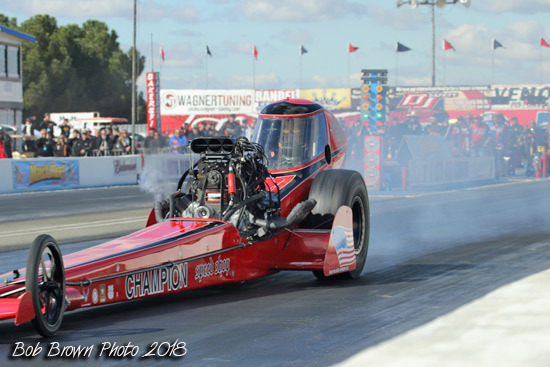 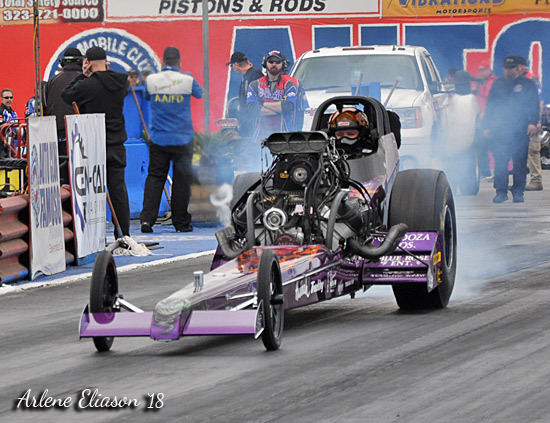 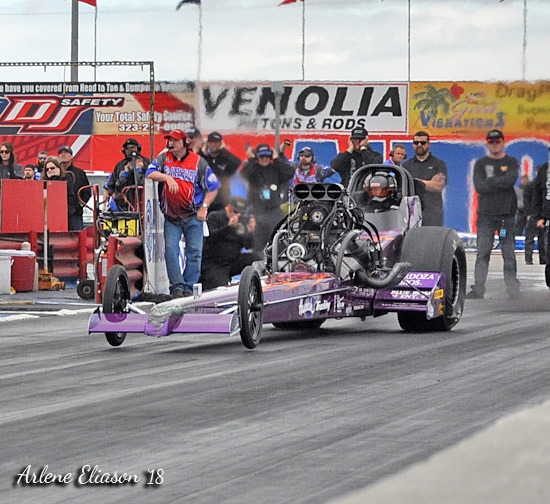 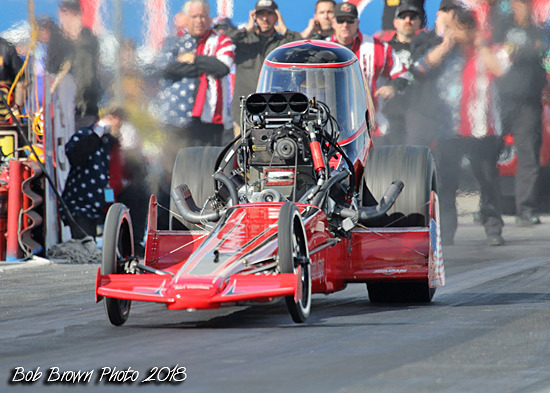 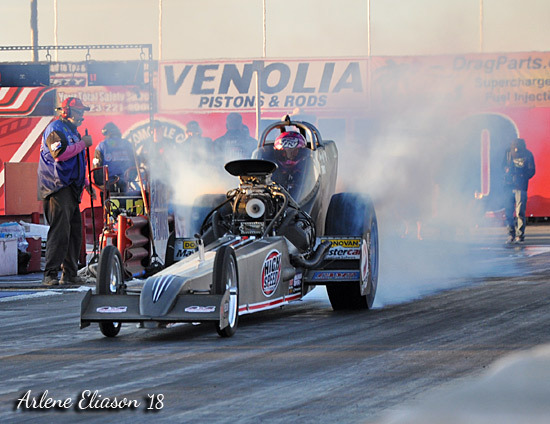 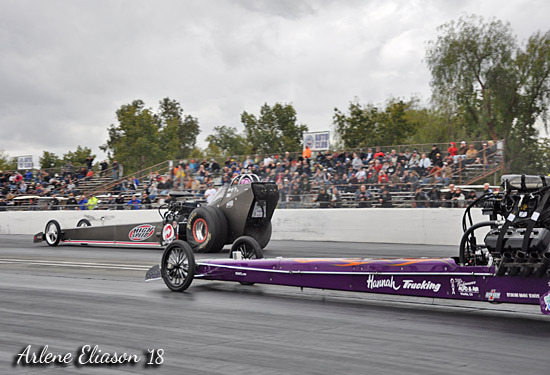 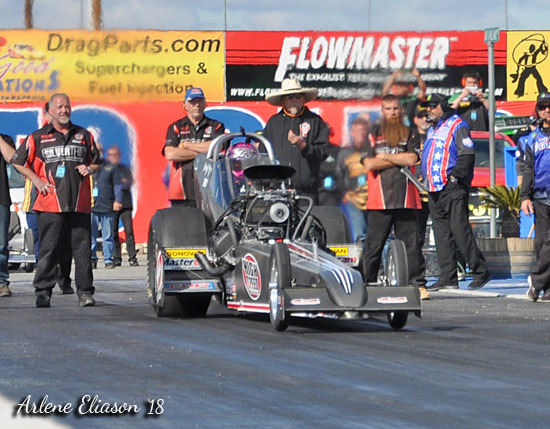 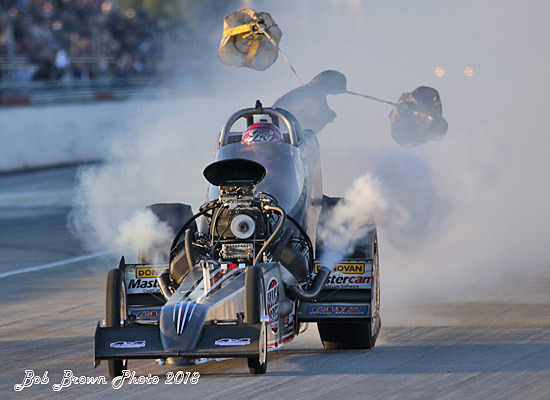 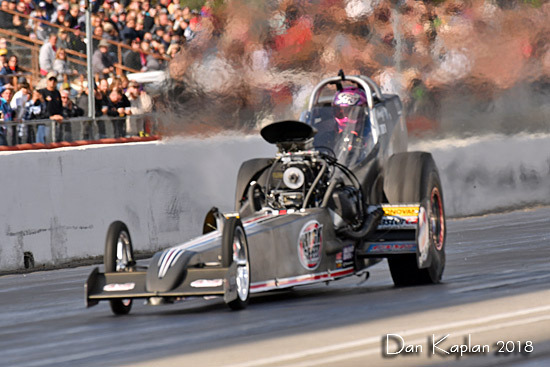 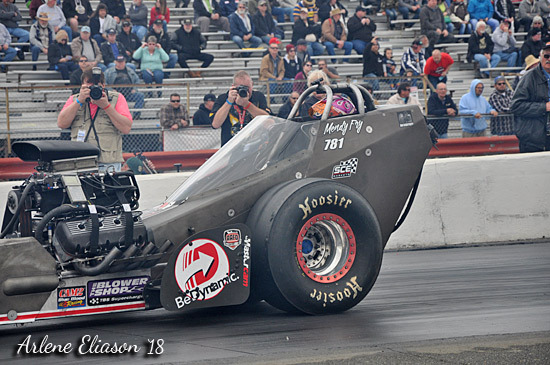 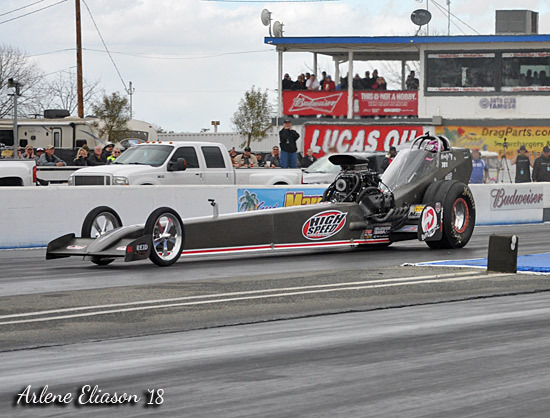 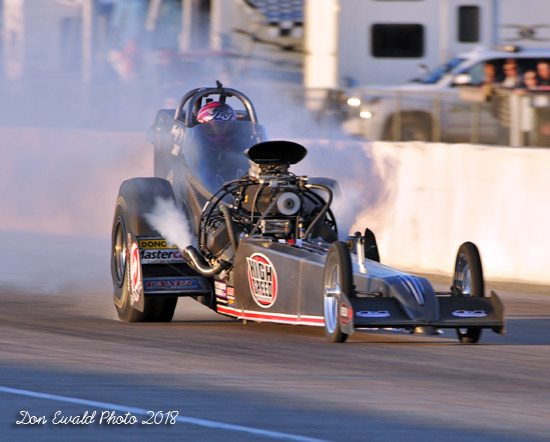 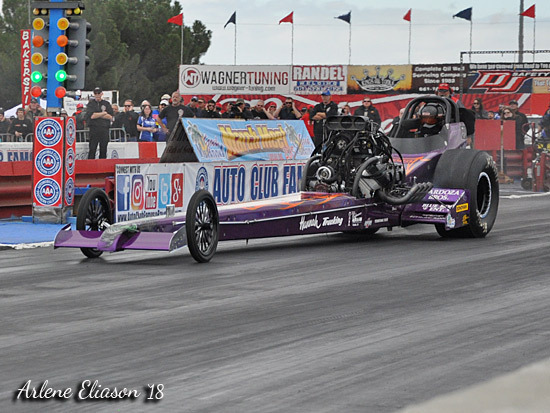 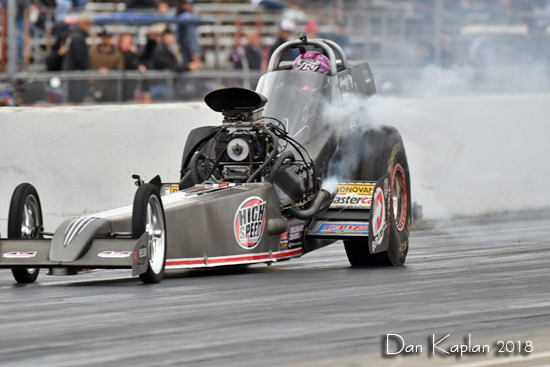 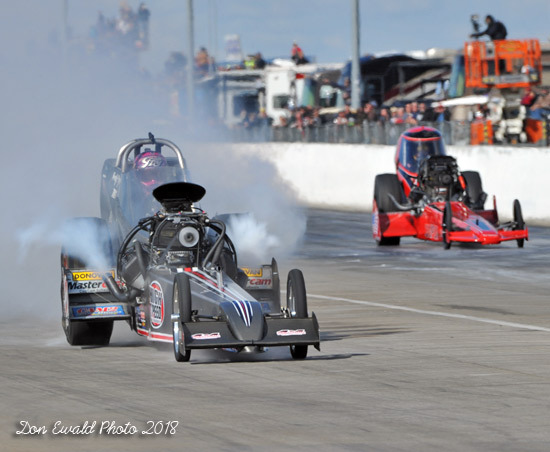 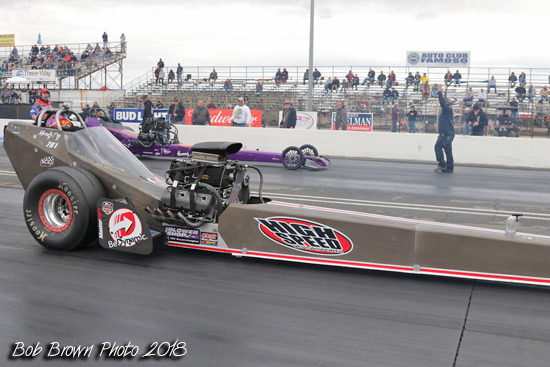 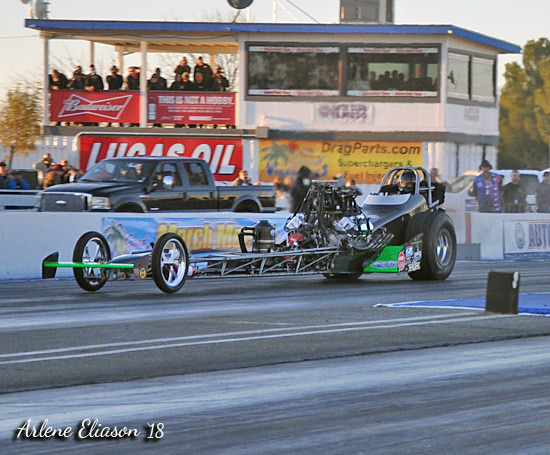 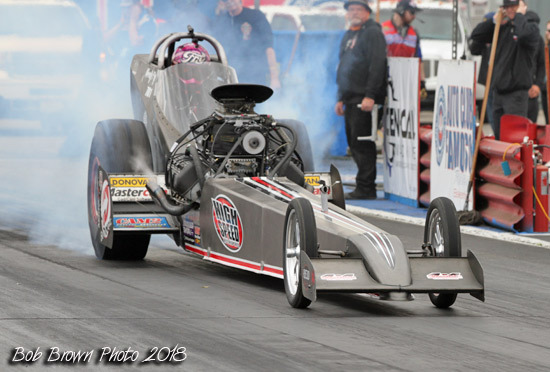 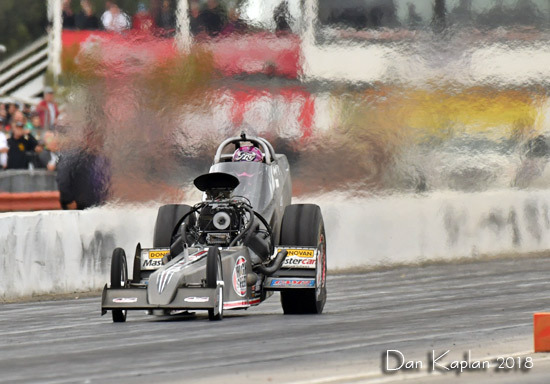 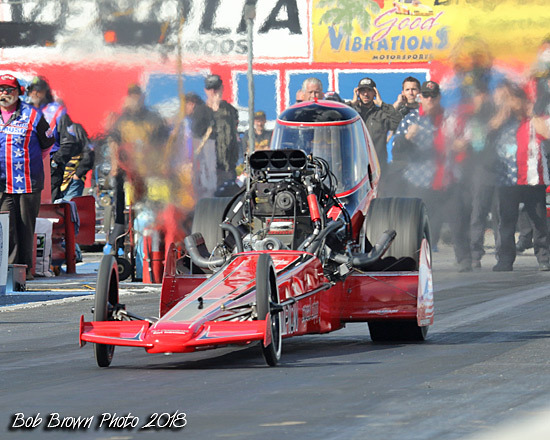 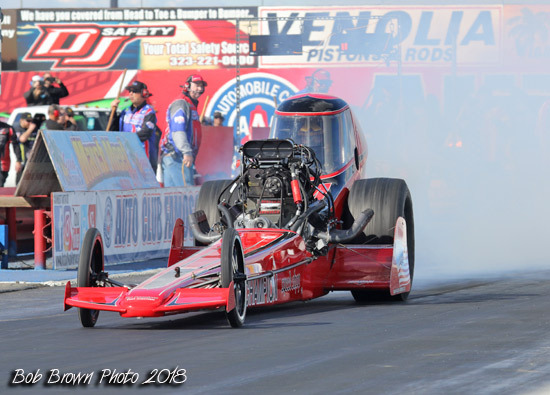 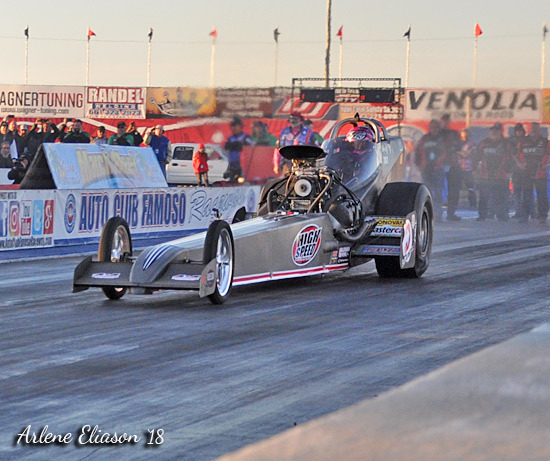 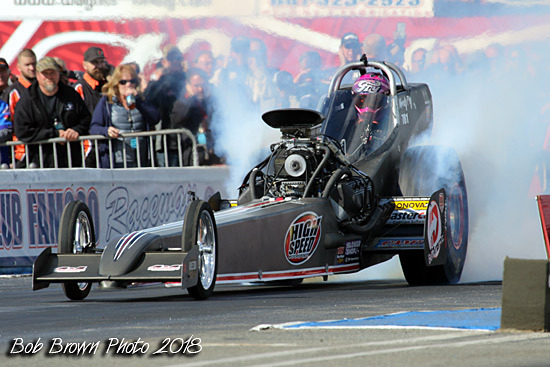 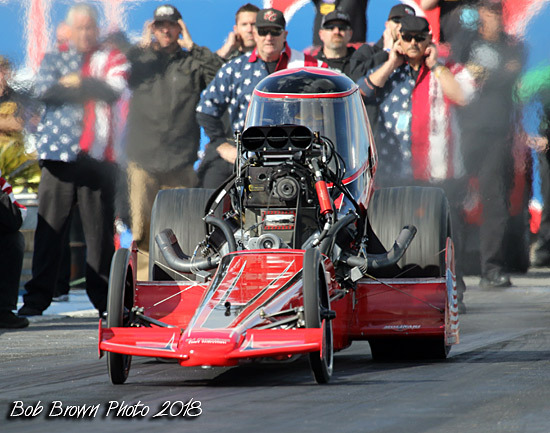 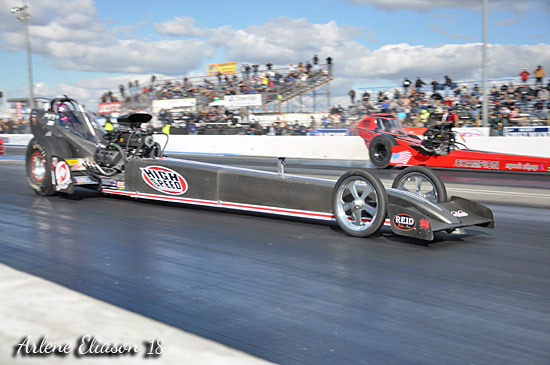 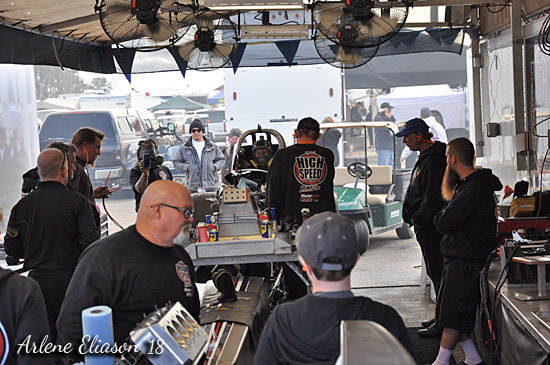 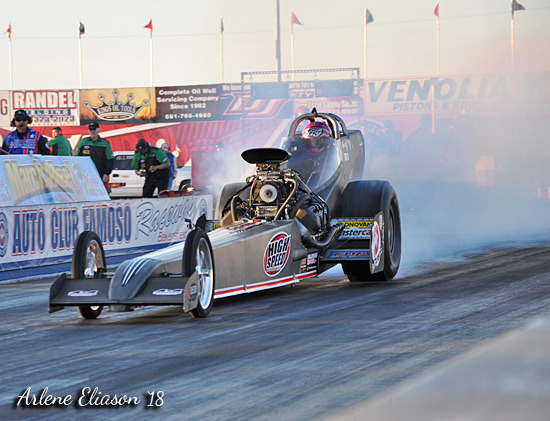 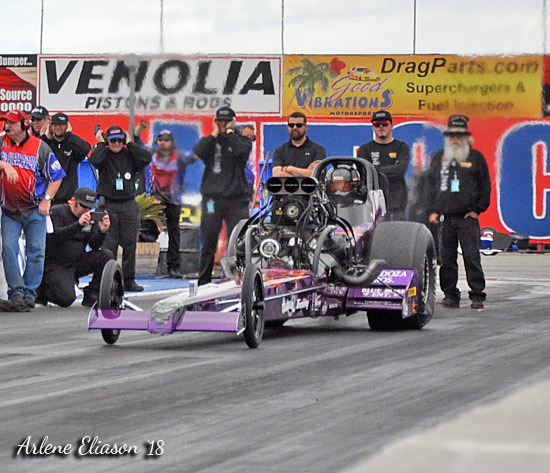 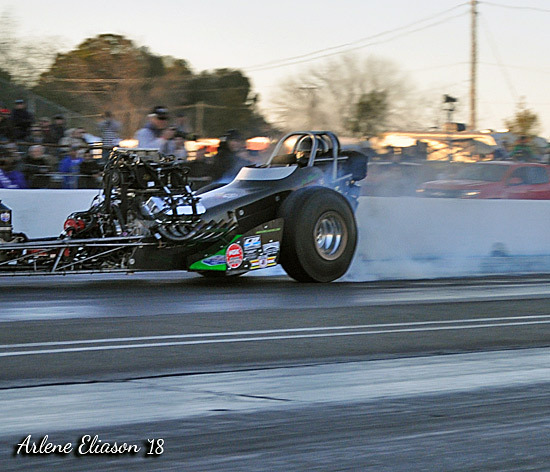 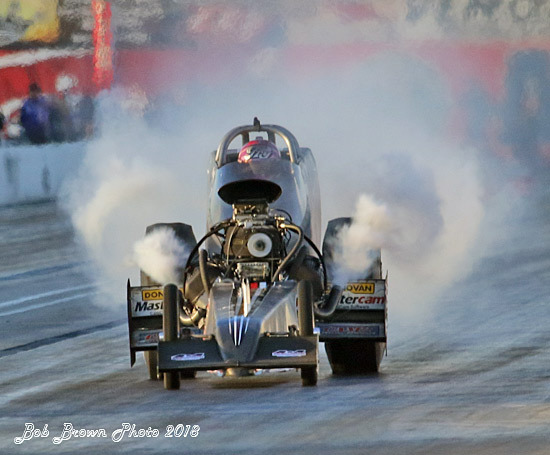 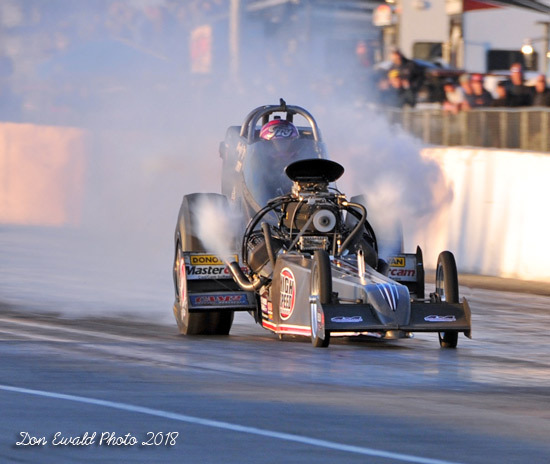 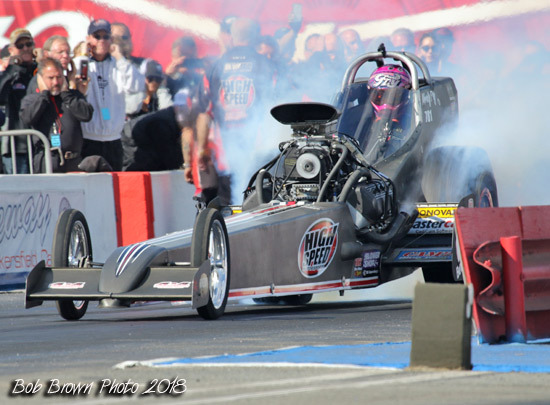 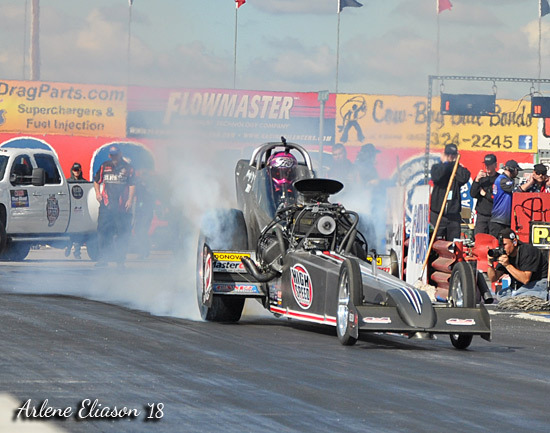 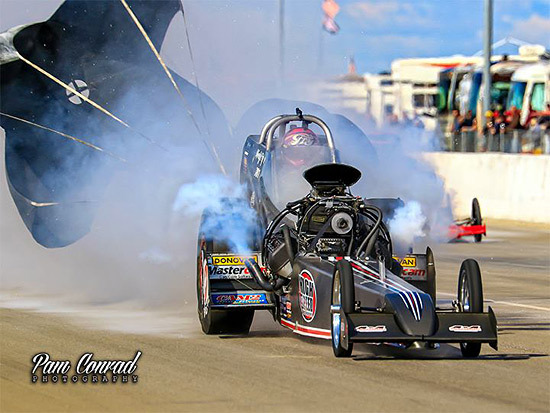 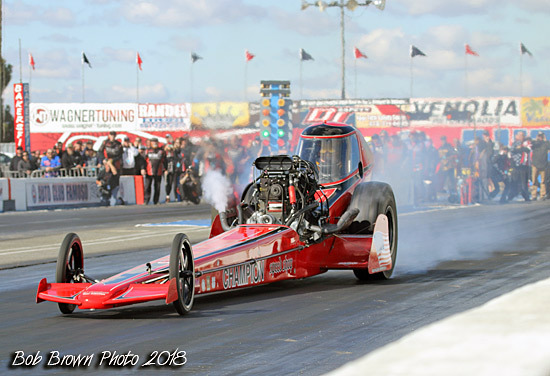 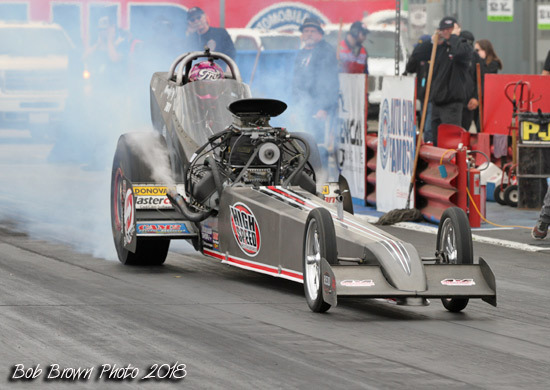 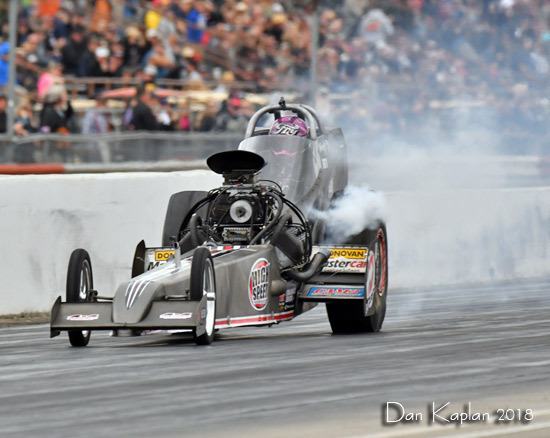 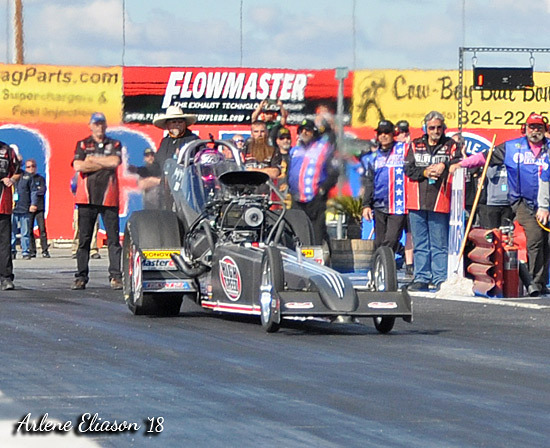 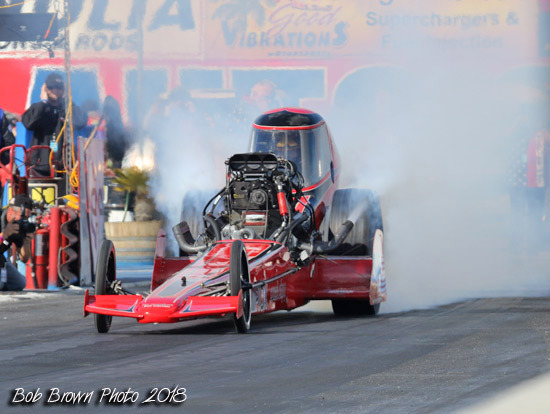 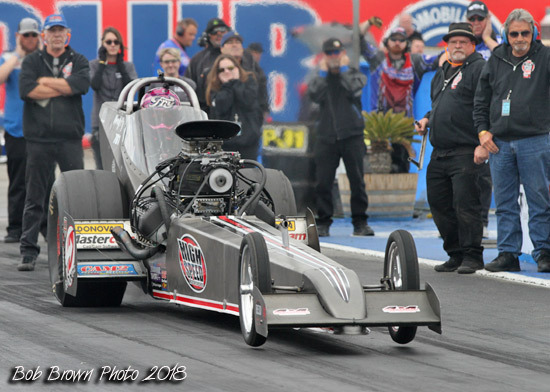 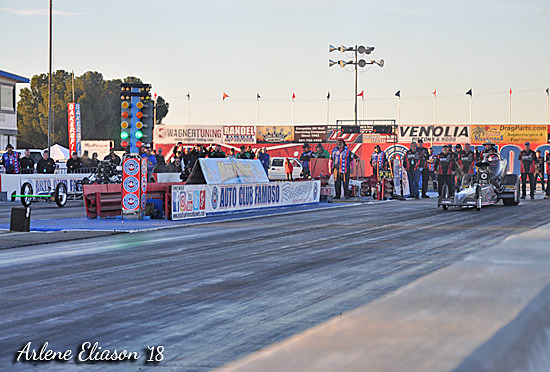 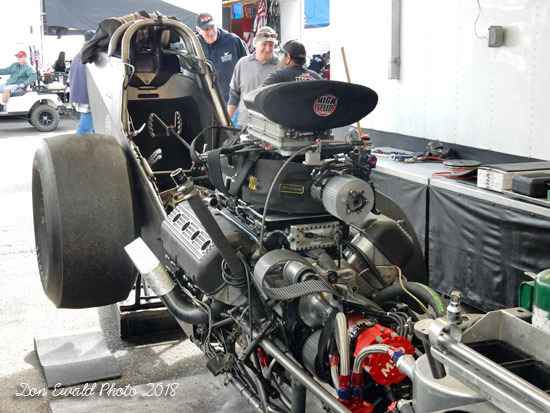 With last minute hopes of running the All-American Fuel Dragster Dirty Dozen 12-car Eliminations dashed, four weather-beaten racers like Tim Cullinan who came all the way from Des Plaines IL, towed back home. 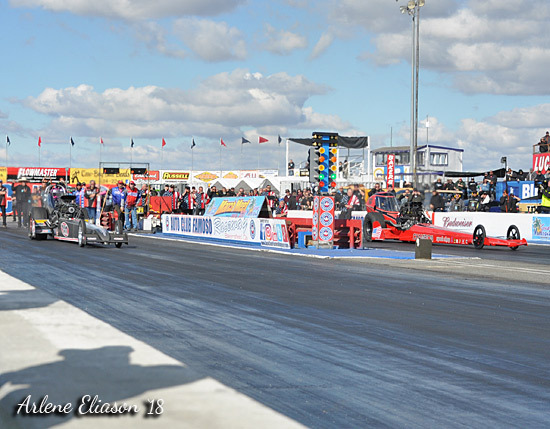 Sunday was insane. 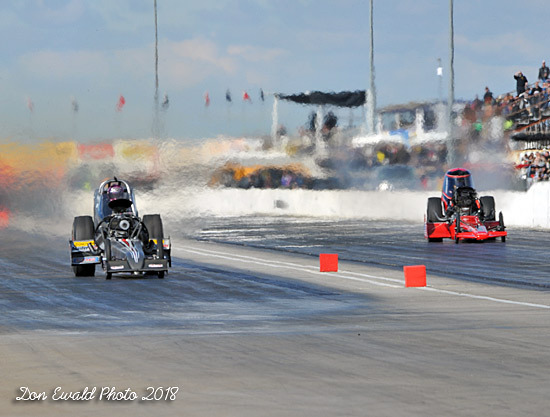 With all the eliminations class cars that needed to get runs and several time consuming delays, the finals were run well after dark. 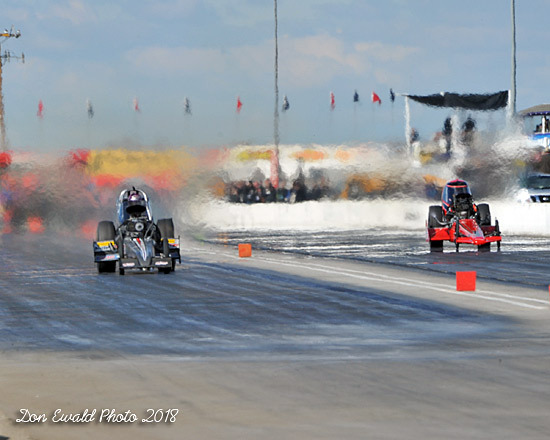 By then the cold temps were colder and the track surface was far below optimal heat. 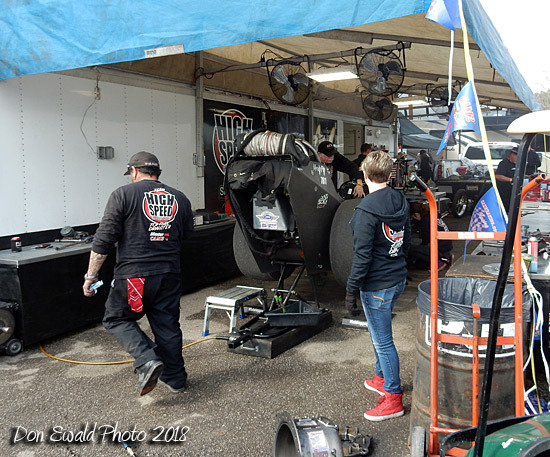 Friday morning found the team getting ready for the first of what was suppose to be two qualifying sessions. 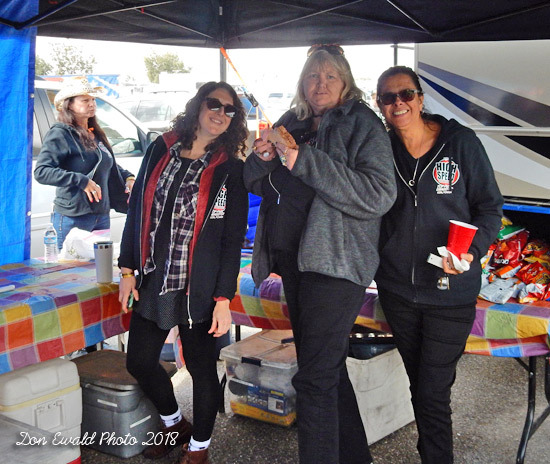 Former team Hospitality Director, now team photographer, Arlene Eliason. 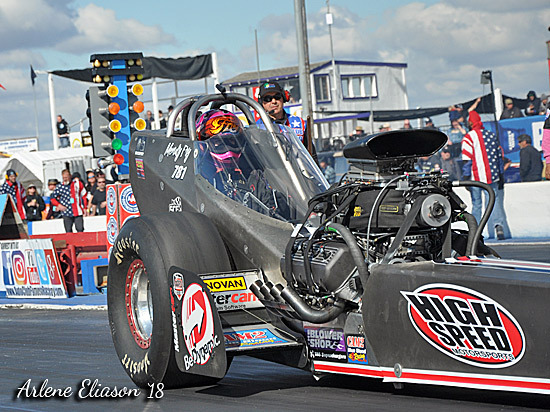 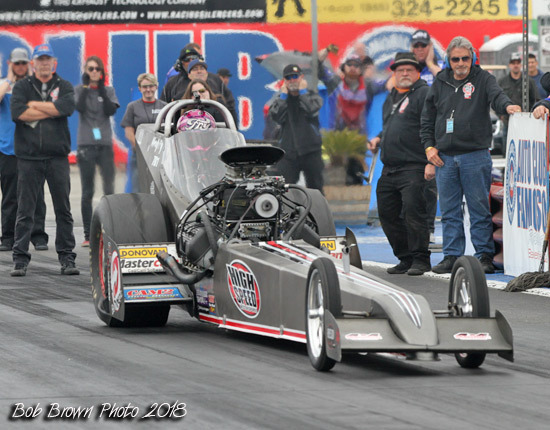 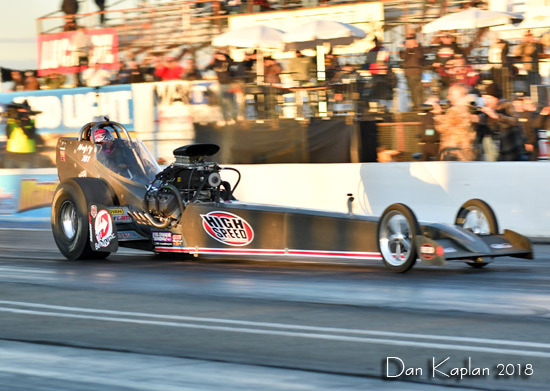 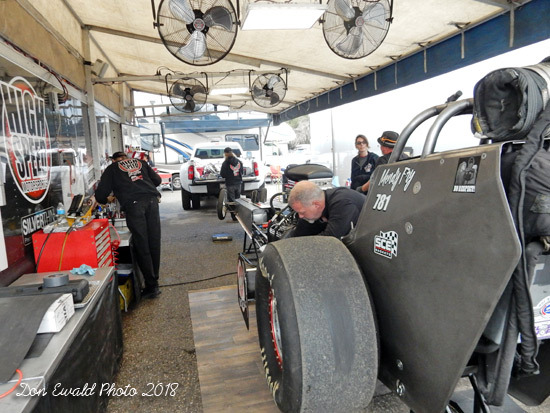 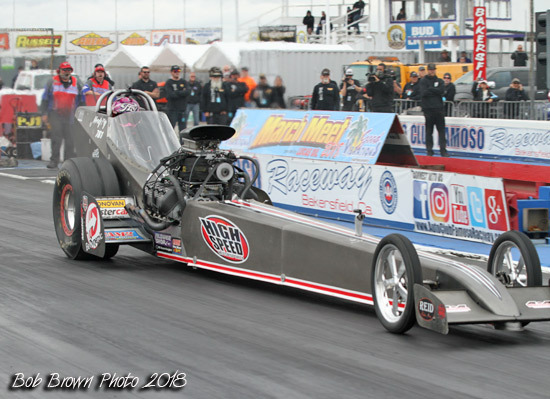 For the first, and what would prove to be the only, Top Fuel qualifying session featured two NTF veterans Mendy Fry in the High Speed Motorsports fueler that finished #2 in the 2017 Top Fuel Championship points. 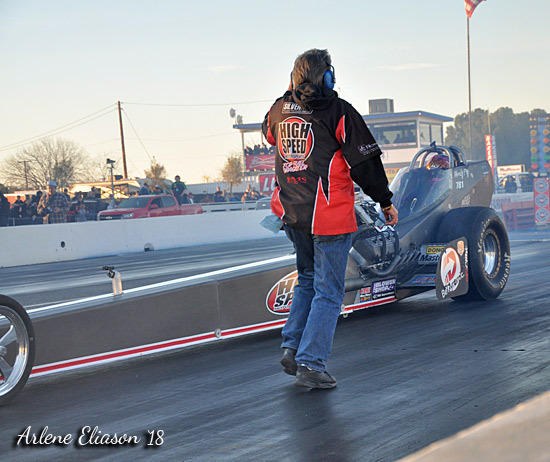 And local favorite, Rick McGee in the Tedford & McGee "Overtime Special". 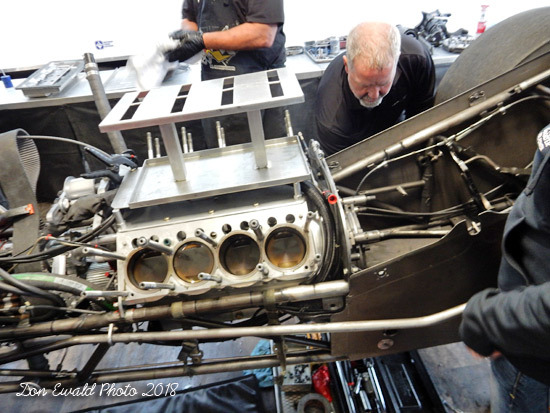 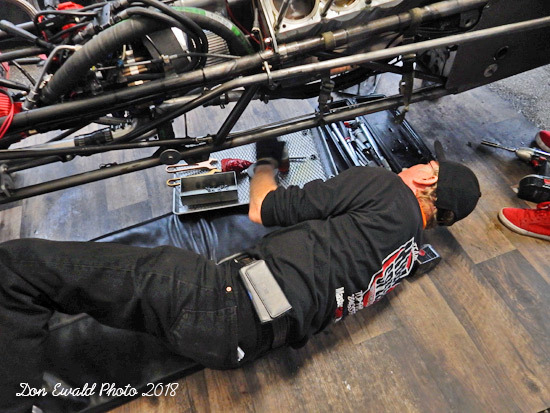 Tom Shelar made final adjustments to the fuel system. 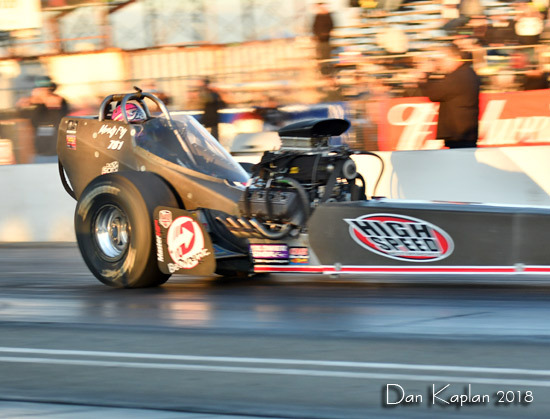 Fry clicked it at the 1000' mark and still carded a nice 5.736 at just 219.51 which showed everyone the track High Speed was there to win. 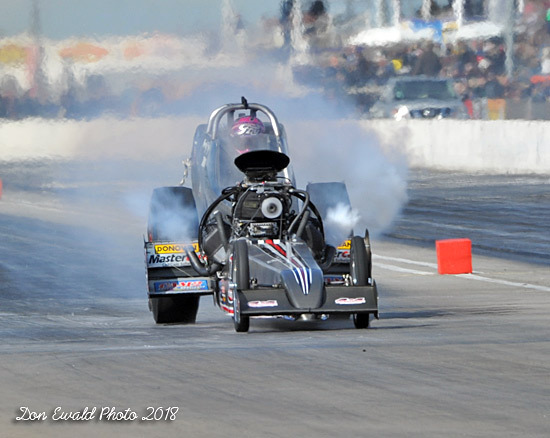 The time put her #1 with a bullet, a full two tenths quicker than the #2 car. 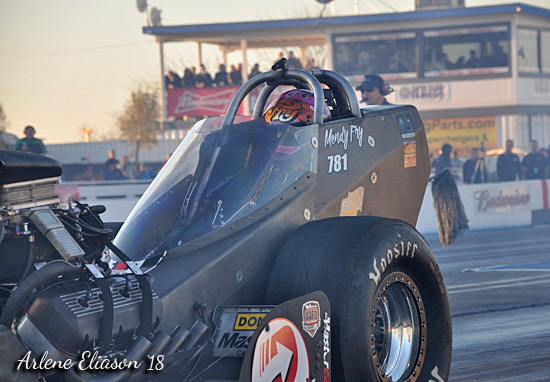 McGee was done early and had to coast to a 13.982 at 63.63 which left him on the outside looking in. 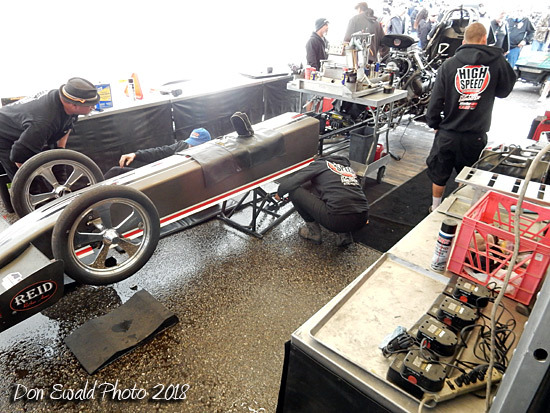 Mendy and Tom adding the good stuff. 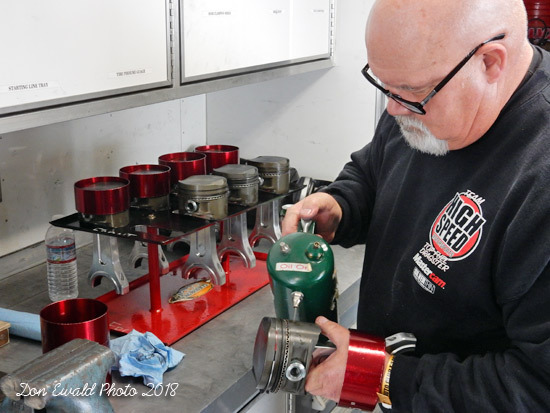 Eric McMorrow prepping the next rack of pistons. 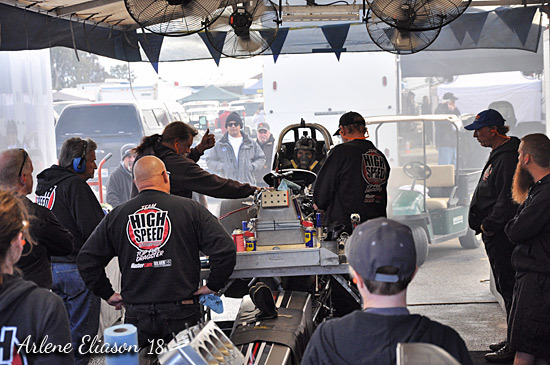 Warm-up prior to the second qualifying session. 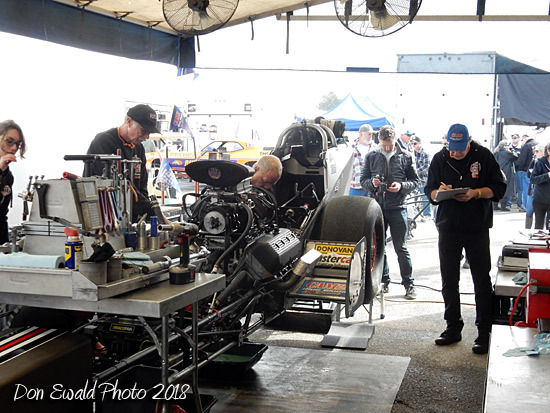 The prep was for naught as the second session of funny car ate up any chance Top Fuel had of getting their second session on a track that had become unsafe. 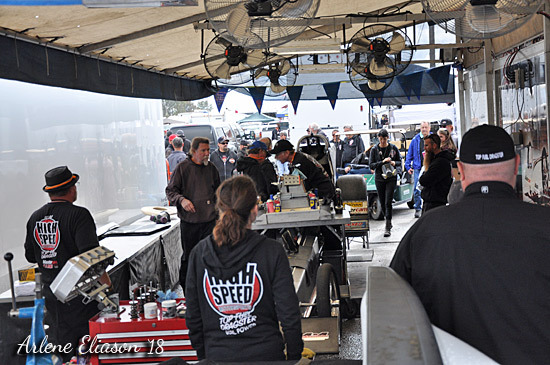 The teams were left to hope for another shot on Saturday. 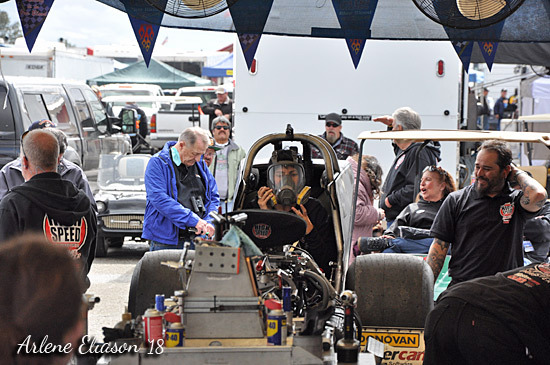 There was a 90% chance of rain forecast for Saturday, but the car was optimistically warmed the engine up just in case every weather report available was wrong. 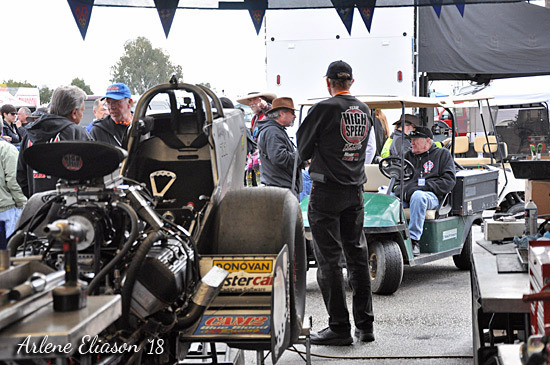 They weren't. 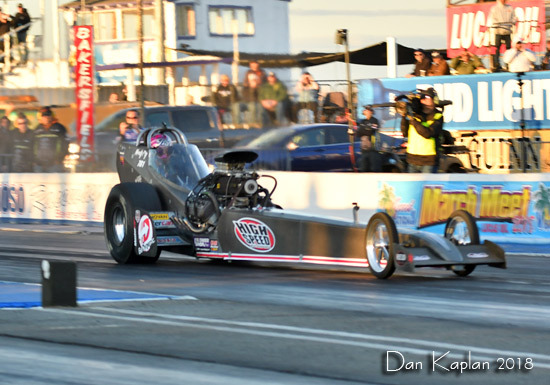 Saturday was a total wright off. 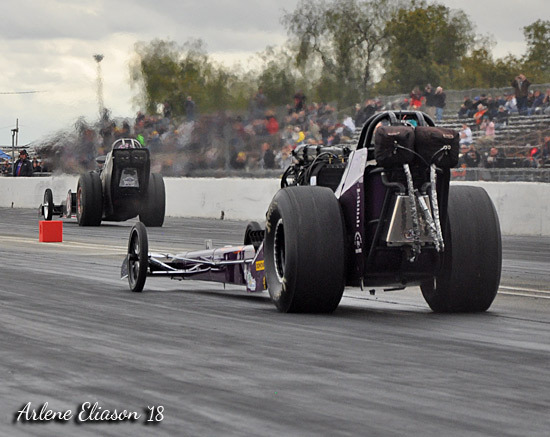 Mendy would stay #1 with her lone 5.736. 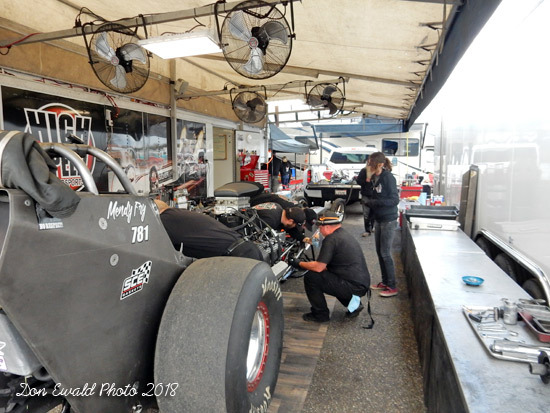 Due to the lone qualifying session, two drivers who would normally be in the top half of the field pitted #1 Mendy Fry and #8 Adam Sorokin. 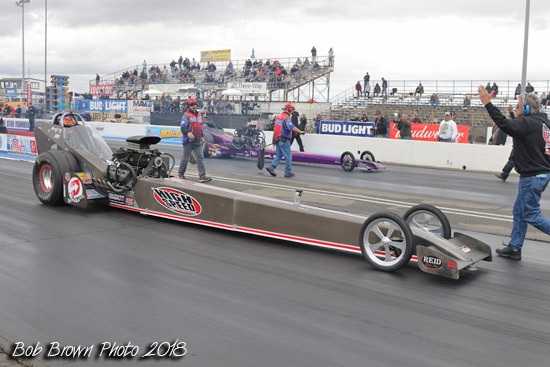 Sorokin was his usual self with a stellar 0.048 RT. 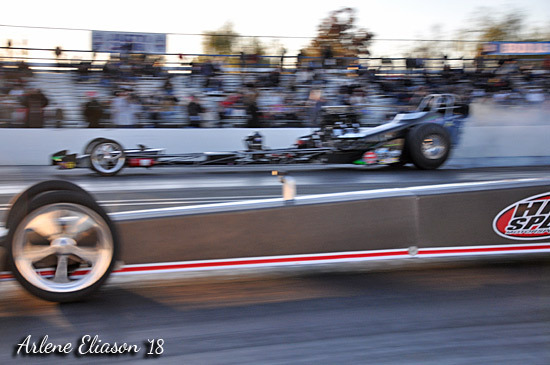 However, the master was second best as Fry cut an even better 0.036 light. 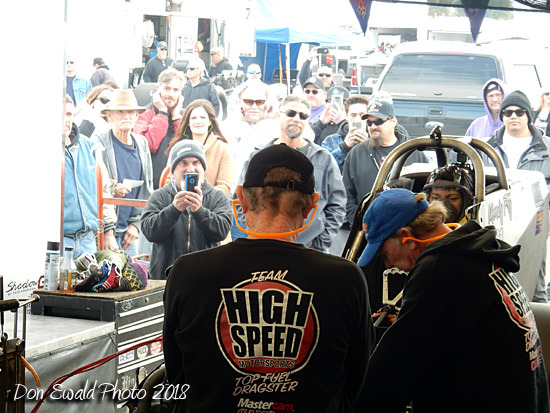 You will hardly ever see these kinds of reaction times in a Top Fuel race. 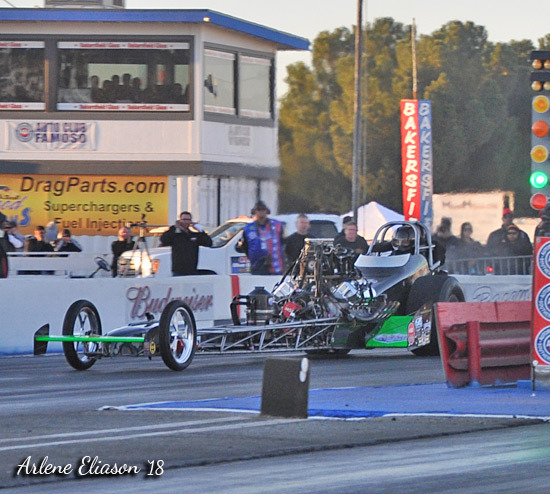 Great job both. 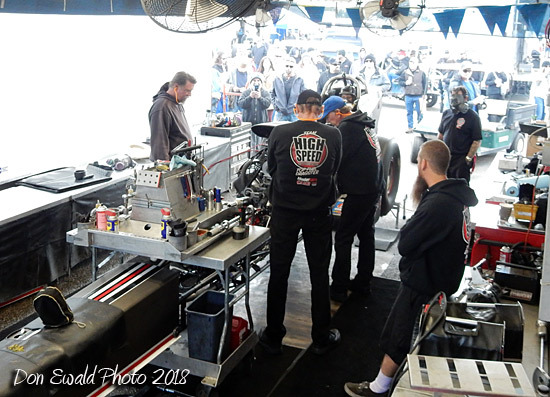 Sorokin recovered and gave chase but it was way too late to cover Fry's monster 5.696 at 261.42 which was low ET for the round by a ton. 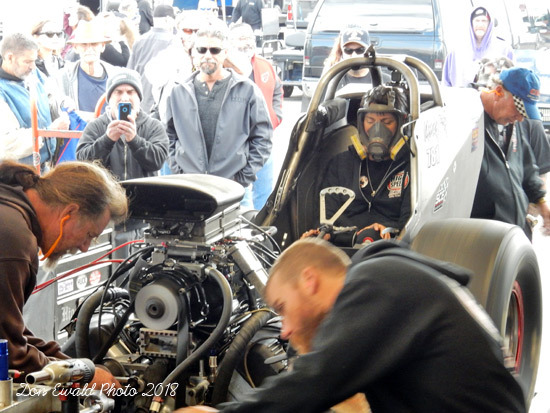 After routine mountainous, the car was ready for round two. 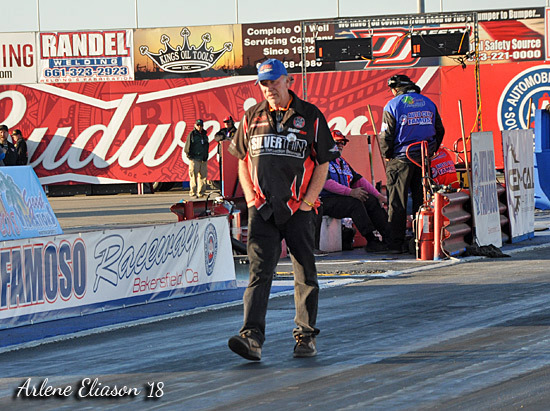 Tom Shelar went out to evaluated the track and decide what lane they wanted. 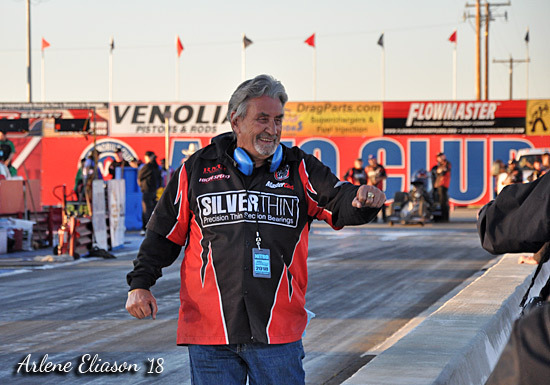 Walt Stevens greeted his fans on his way out to his back-up position. 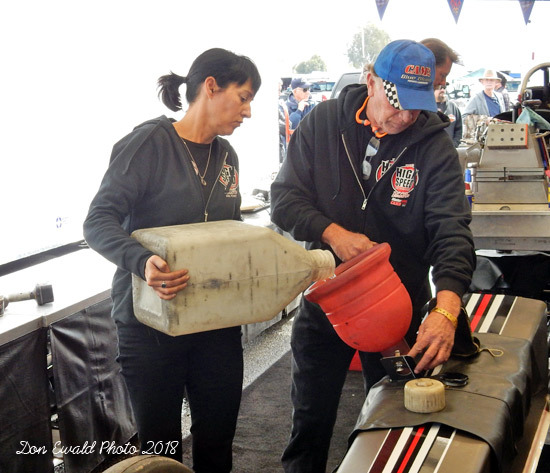 Out of the waterbox came Mendy Fry and Jim Murphy, who finished one-two in the 2017 points race, to see who would go to the final. 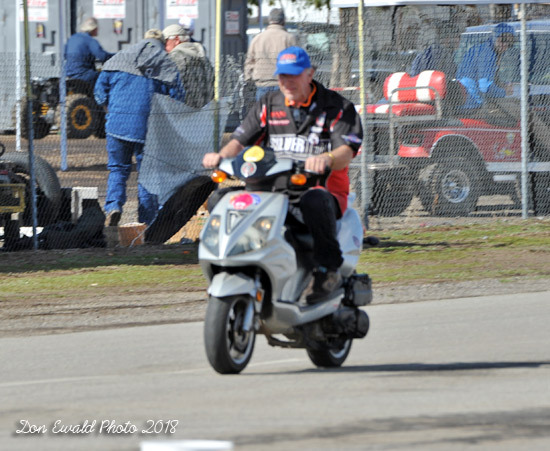 Murphy was away first but that was short lived. 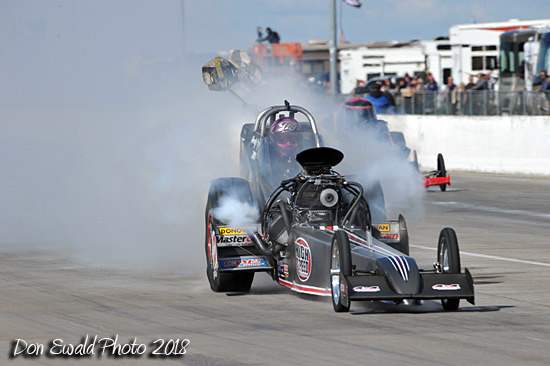 Murphy went into tire smoke at the 60' mark, game over. 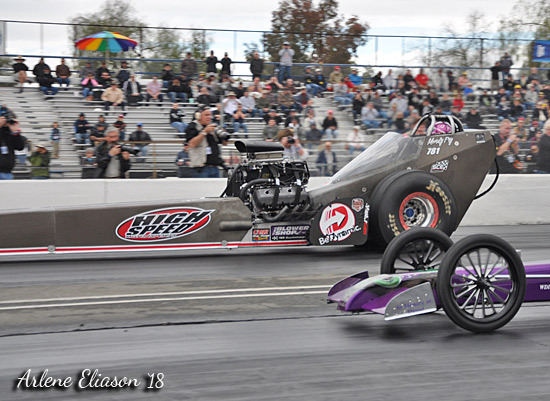 Fry once again showed everyone that the High Speed car was by far the class of the field, carding a 5.600 at 250.97. 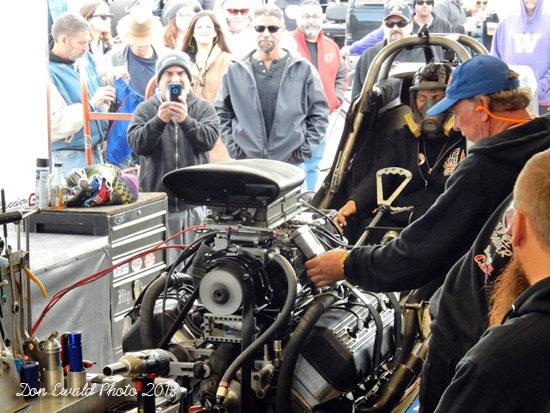 Murphy coasted through.